Whether you are focused on corporate social responsibility, human relations, public relations or supply chain management, human rights and sustainable development goals have an impact. We’ve launched a new Human Rights Around the World and In the News Tracker to monitor and analyze media related to the UN’s 17 sustainable development goals to make it easier for you to stay on top of these important issues. Within the site, we’ve grouped the SDGs into the five groupings—Peace, People, Prosperity, Planet, and Partnership—to easily track and follow the trends in news coverage and identify the stories and progress being made toward achieving the goals. Interactive charts show coverage over time and other news trends. While at the microsite, hover over and click on the charts to learn more about the content behind the data points. 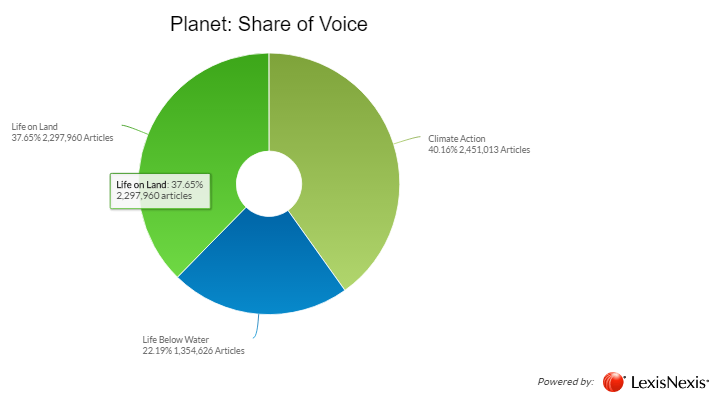 If you are running a blog or site to track the SDGs, you can even snag the embed code to include the chart within your own page! The Human Rights Around the World and In the NewsTracker is based on the same information and technology as the interactive charts on the RELX Group SDG Resource Centre, but you’ll find a different spin on the charts. Each section showcases a 30-day glimpse into coverage over time and then one additional chart highlighting a different way to analyze the media. We’ll continue to update the Human Rights Tracker with new charts and SDC-related blog posts—be sure to scroll to the bottom! With our Human Rights Around the World and In the News Tracker, staying up-to-date on the latest information has never been so easy. Check it out for yourself!